Click here to view the JPEG you need for this project! Right-click to save it and load the shrink film into your printer. Print the JPG at 100%. Part of the image will be cut off — this is ok! The image is larger than the printer’s printable area, but the important stuff will still be there. 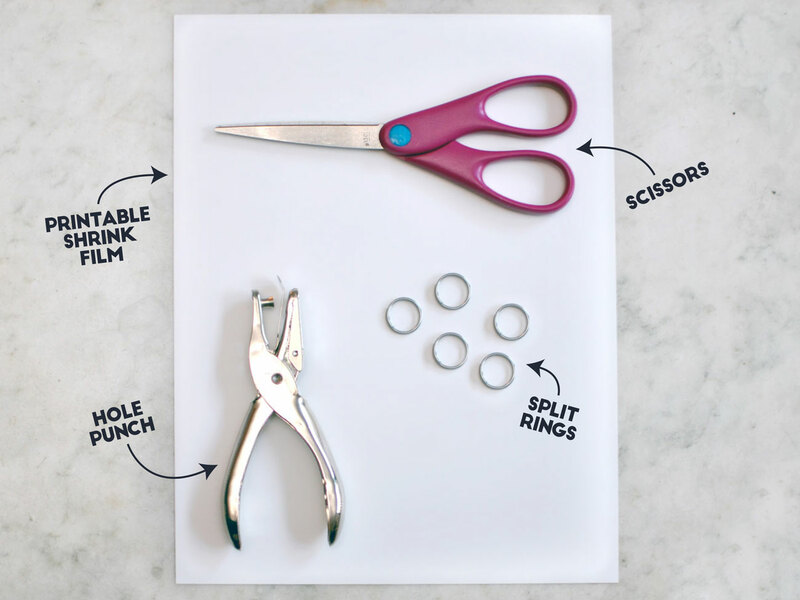 Cut out each heart using a pair of scissors. Easy peasy! 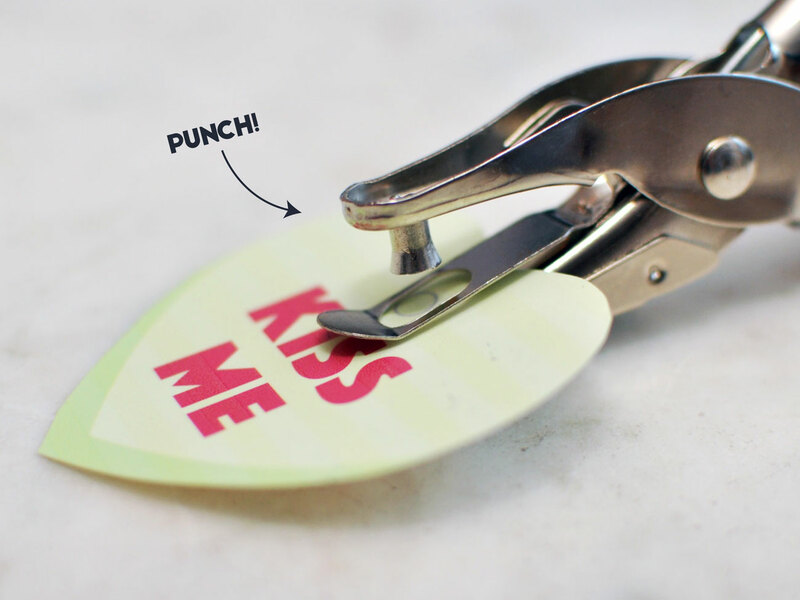 Line up the hole punch with the circle on each heart and punch it out. Be sure to do this before baking! Bake according to the shrink film’s directions. My package suggested using wax paper or medium-weight cardboard as a base, so I used cardboard. Please exercise caution. If you are a child, have an adult do these steps for you. Be careful — we don’t want anyone to be hurt! 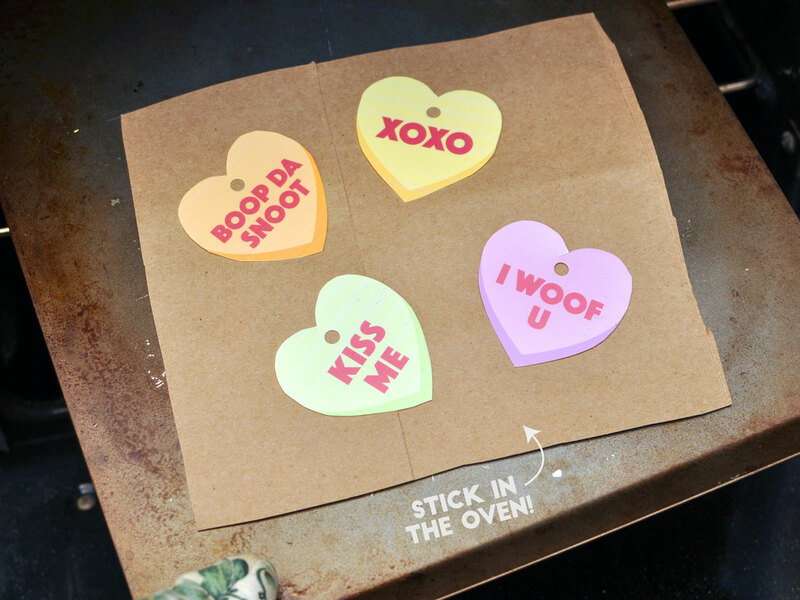 After removing the charms from the oven, use a piece of wax paper to flatten them if necessary. (They will be hot so be careful!) Then, let them cool. Put each charm on a split ring and attach it to your dog’s collar. That’s it! Easy, right? 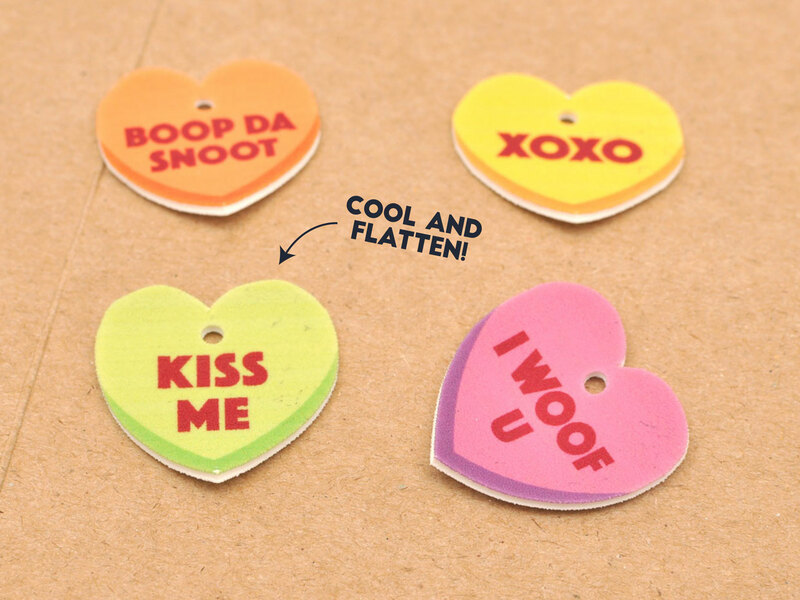 These also make great Valentine’s gifts for all of your canine friends! Or – if you prefer – put one on a chain and wear it as a necklace. There are lots of possibilities! 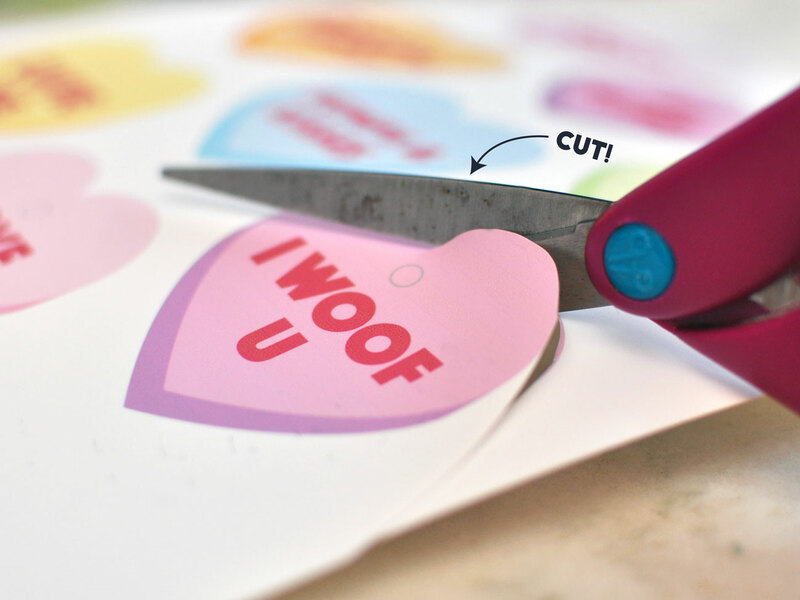 Want another way to show your love for your pup? Check out our Friendship Collar and Bracelet tutorial! This is absolutely fabulous – we love it!! 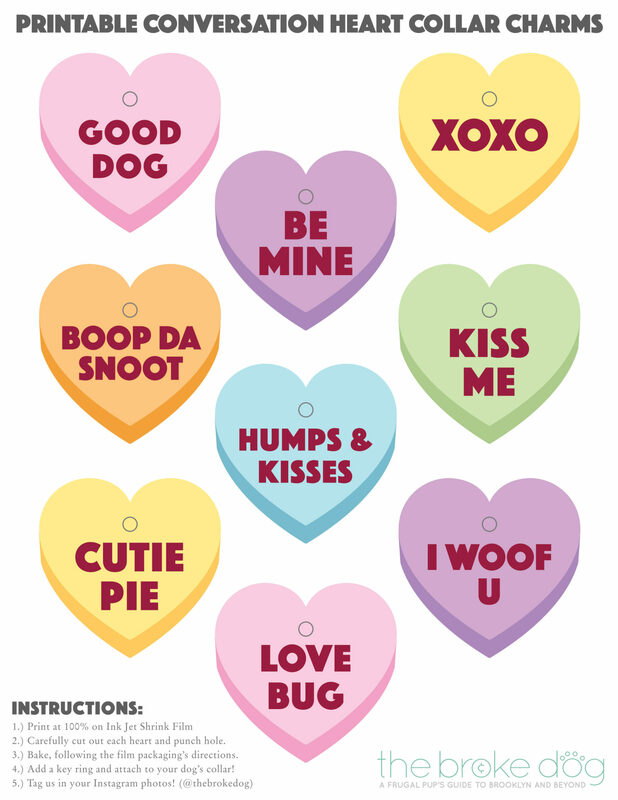 We are going to make these little ‘shrink dink’ charms for our dog pals. You made it all so clear and easy to do – I appreciate this greatly as I’m a bit challenged when it comes to these sorts of things. Lovely job – and I’m going to share it with our readers! These are so cute, what a fabulous idea. I wish I would have thought of it myself! I’ll be sharing this! These would make the perfect charm place for any cat or pup loving little girl wouldn’t it! I was coming up with other thoughts like, these could be maybe be printed on to polyclay and then varnished as single charms for necklaces. This would make a great rescue fundraiser!! Such a cute idea and a perfect project for mums (or dads) and their kids. I would’ve loved to have been able to make these tags for my pets which I was younger. Absolutely adorable! Henry is all ready for Valentine’s Day! What a cute idea! Kitties could wear these, too. And they look easy to make. How fun is that!? Pinned it. Looks like a great craft. This is such a cute idea! I like that it is so simple and inexpensive. You could change up your charms all the time if you wanted to. 🙂 These could even be made kitty sized. Oh I love these! I really love DIY projects and the weather has been so crappy so these are perfect for this week. I love these as gifts and you made the directions so easy to follow. I can have husband Mike print these out tomorrow at work. 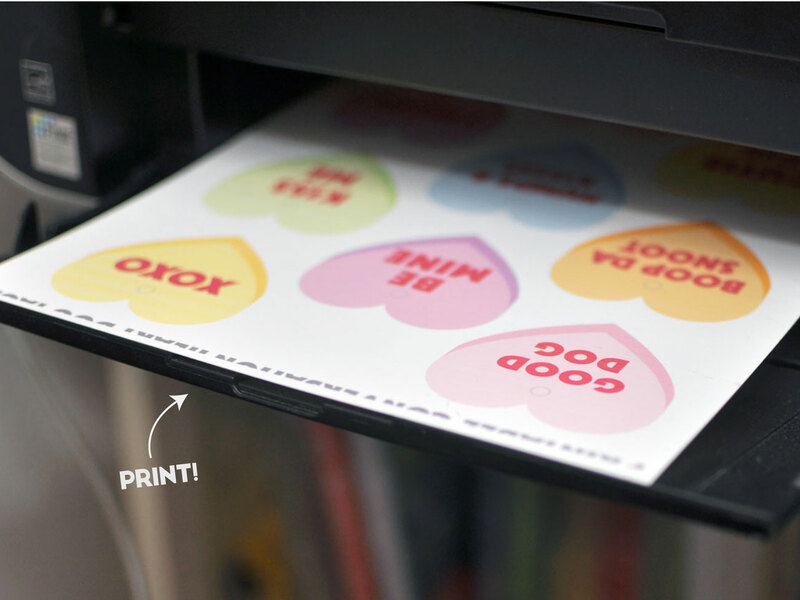 Thanks for posting such a fun project for V-Day – and it’s cheap! Yay, thanks! Just make sure to use the shrink film paper 🙂 Crappy weather is the worst! Your DIY posts are the best! Once again I feel like I can actually do this! 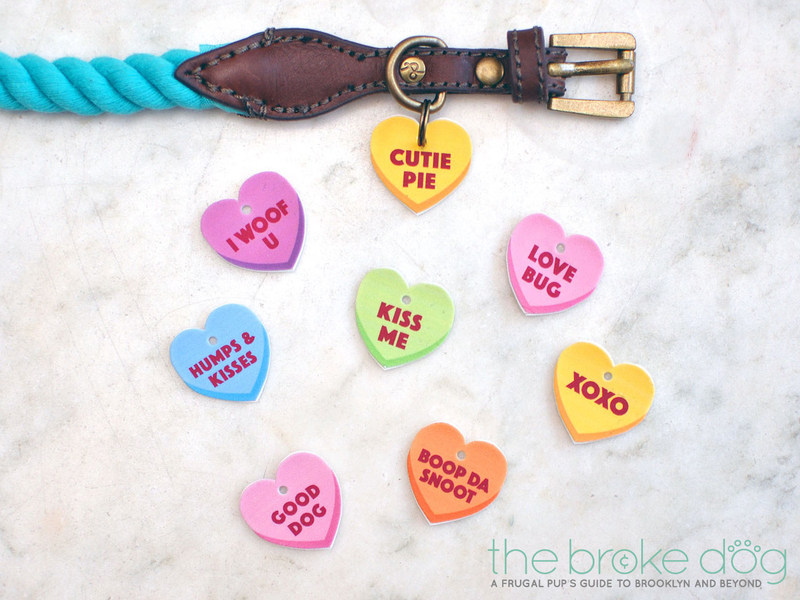 In fact, I’m going to DIY my Chihuahuas some nice little heart charms this week….LOVE!